So unfortunately, aside from our amazing dinner at Alinea, Marcus and I weren't able to explore Chicago as much as we would have liked during trip a couple weeks ago, as we were staying with family about a half hour outside of the city. We didn't realize that NATO was going to be in town for a two-day conference, resulting in the citywide shutdown during the Saturday and Sunday that overlapped with our trip. Along with this circumstance and Marcus's painfully inflamed elbow, we lost three days of traipsing around the city, which included our anticipated hot dog crawl at Hot Doug's and Franks 'n Dawgs, dessert sampling at (Mindy's) Hot Chocolate and the Doughnut Vault, and possibly having drinks at the John Hancock building to enjoy the awesome view from its 95th Floor. This all left us one evening for Alinea and just one remaining day for exploring Chicago. But despite this unlucky happenstance, Marcus and I were still able to squeeze quite a bit in on the Friday we were there with my mom and Kai Ma (my godmother), including a visit to the Art Institute of Chicago (one of my favorite things to do in the Windy City); a walkthrough of Millenium Park to see Anish Kapoor's Cloud Gate and Frank Gehry's Jay Pritzker Pavilion; and the Chicago Architecture Foundation's in-depth architectural river cruise along the Chicago River. 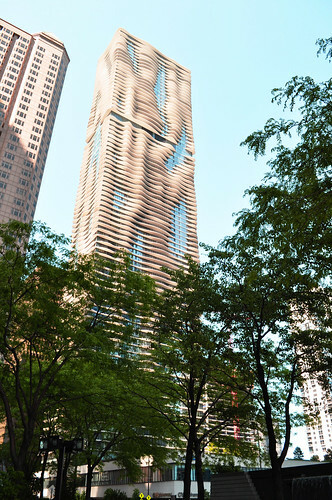 One of the buildings we had admired during the river cruise was Jeanne Gang's Aqua Tower -- an architectural marvel that soars high with undulating concrete balconies that emulate waves and ripples along the buildings four-sided exterior -- an homage to its location near the Chicago River and Lake Michigan. Ms. Gang had shared that "striated limestone outcroppings are a common topographic feature of the Great Lakes region, which served as inspiration for these slabs." The name "Aqua" keeps in theme with the surrounding developments in the Lakeshore East neighborhood that all have nautically themed names (e.g., The Tides, The Shoreham, etc.). Construction began in 2007 and was completed in 2010. The ripples were certainly the most challenging part to the building's construction -- given that each floor plate in the Aqua is unique (as is each ripple created in a body of water), construction was more complicated than usual. Since completion, the tower splits into two parts -- apartments/condomiums/penthouses located in the top half and the Radisson Blu Aqua Hotel occupying the first eighteen floors from ground level. 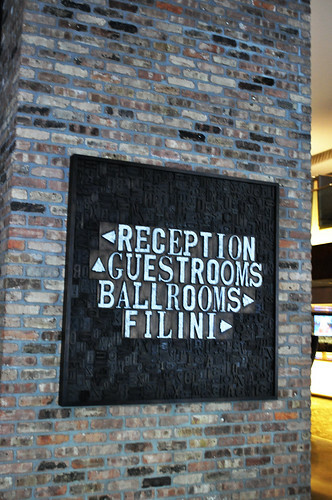 Because we admired the building so much, Kai Ma thought it would be an excellent idea if we had our late lunch in the Radisson Blu's restaurant, Filini. 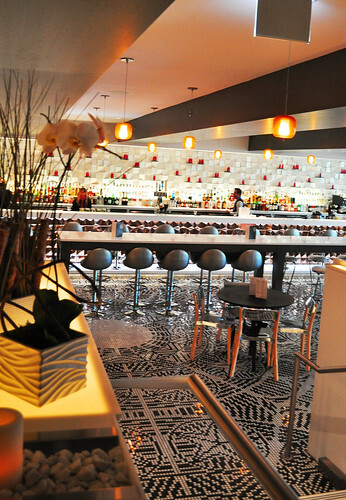 The very modern lower bar area of Filini with very intricate mosaic flooring. 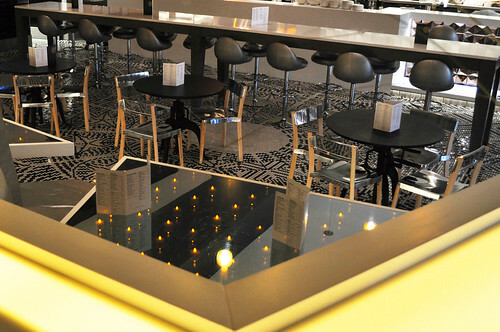 Look at those lounge tables -- they have little electronic tealights scattered inside them! 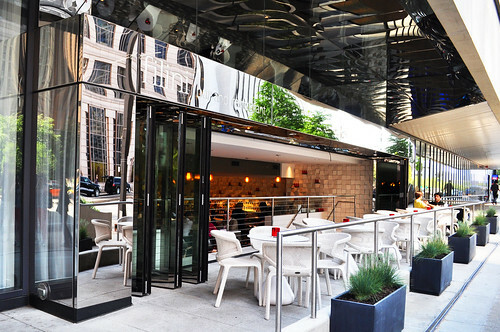 Committed to creating authentic Italian ingredients with the freshest of ingredients with a striking combination of style and service, Filini is a contemporary Italian restaurant and bar. It "honors the traditions of classic Italian cuisine and culture with an upscale, urban energy, boasting unpretentious yet exquisitely prepared Italian fare." Leading into the bar is an outdoor terrace for guests and patrons to enjoy the restaurant's main menu or abbreviated bar menu al fresco. 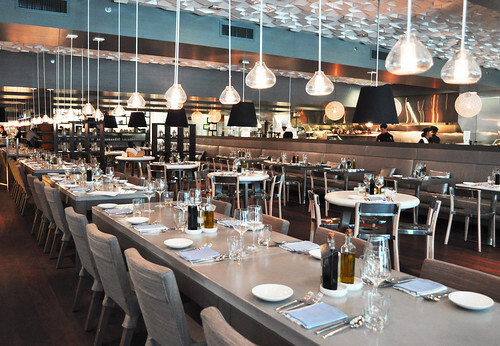 Filini's main dining area is located on the second level with modern globe light fixtures and white ceramic, geometric tiles as the backdrop and on the ceiling. There is also a glass-encased wine wall which showcases the restaurant's wide variety of Italian vintages. 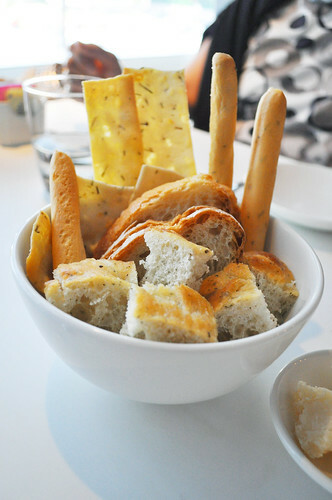 A bread bowl with some fun choices -- country bread, focaccia , bread sticks, flat crackers, etc. To start, the four of us shared polipo -- an octopus salad with black and white chickpeas, radicchio, and arugula. For me, you can never go wrong with an octopus salad -- or anything octopus for that matter. It's usually mine and Marcus's mutual go-to. It's even better when the octopus is prepared really nicely, as it was at Filini. 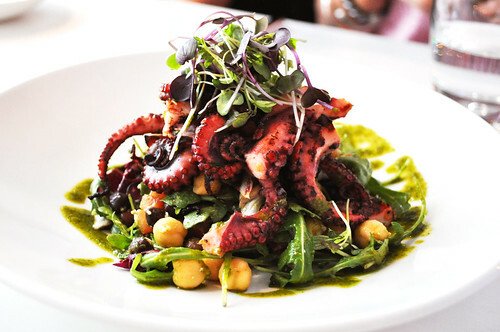 Tenderly chewy and slightly charred, the octopus was a delicious protein immersed in the bed of arugula. The dressing was light with a zest of citrus, and the chickpeas of two colors added a nice textural contrast to the leafy and the chewy. Great lunch dish! The rest of our meal was family-style too, with three courses shared. Kai Ma selected the piatti del giorno (Italian for "plate of the day") for venerdi ("Friday"), which was cioppino with fennel, tomato, saffron aioli, and garlic bread. 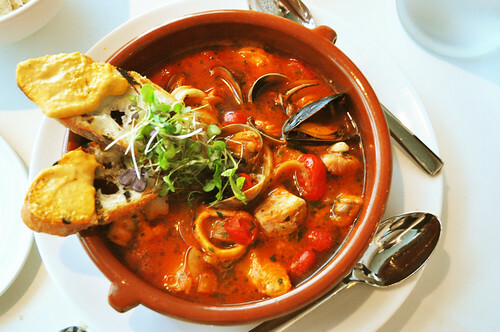 Cioppino originated in San Francisco as an Italian American-style fish stew (similar to an Italian cacciucco and a French bouillabaisse. Let's just say we spent our entire bowl of bread, even the second one that our waitress generously replenished, sweeping up the concentrated red broth of the cioppino from our plates. It would be difficult to enjoy this stew without a crusty and starchy loaf to soak it all in for you. Though this isn't necessarily an authentic Italian dish, with each bite, my imagination got the best of me, as I envisioned the four of us sitting at a bistro along the Mediterranean, chitchatting while enjoying this delicious fish stew. Rustic, flavorful, and sweet (in the way that seafood shows its true colors), this was a fantastic choice for lunch. 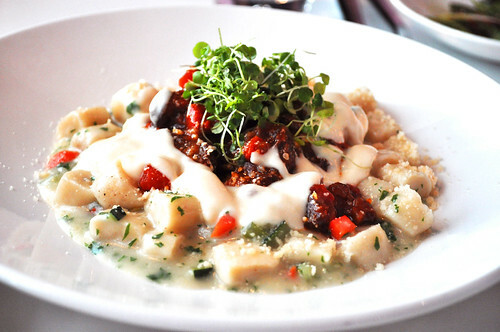 Marcus suggested we order the gnocchi with braised oxtail, vegetable ragù, and pecorino fonduta. The gnocchi was so soft -- pillows of semolina that just melted against the warmth from our palates. The braised oxtail was the kind that falls right off the bone, breaking apart into soft, tender chunks that had plenty of cooking hours embedded into its stewed tomato-based flavor. All the ingredients had some sort of creamy quality to it, with the sweetness of the tomato to break down the heaviness of the pecorino fonduta and vegetable ragù a bit. I haven't had many amazing gnocchi dishes prior to this one, so it will be nice to have a spectacular benchmark (famous last words?) now. I would love to learn how to make fresh gnocchi, too. Seems like an interesting feat to which to attest! 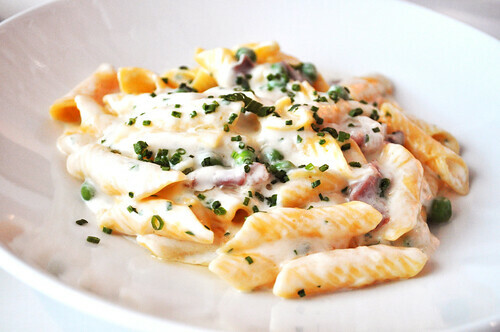 I also couldn't resist ordering the garganelli with prosciutto, peas, mascarpone, truffle oil, and chives. I mean, seriously, who could say no to that combination?! The garganelli pasta has an interesting origin. An egg-based pasta formed by rolling a flat, square noodle into a tubular shape, garganelli pasta, to the Italians residing in Emilia-Romagna at least, resembles the neck end of a chicken, from where its name originates (garganel is Italian for "esophagus"). According to Caz Hildebrand and Jacob Kennedy's The Geometry of Pasta, this unusual shape of pasta has a noteworthy legend behind it. A poor massaia (i.e., housewife) near Ravenna (the pasta's region of origin) had rolled out pasta and cut squares for making tortellini, but had quickly discovered that her cat had eaten all the filling. Her guests began to show up, so "she quickly rolled the pasta up over a loom comb" forming the garganelli we see today. The Geometry of Pasta also stipulates that this pasta is usually eaten asciutta (literally Italian for "dry" which actually means "in sauce" as opposed to soup), especially in a creamy sauce of ham and peas -- just like the one we had at Filini! With the right consistency of creaminess (yay for mascarpone! ), of saltiness from the prosciutto bits, and of the earthy umami-ness from the generously sprinkled truffle oil, the garganelli was one platter of rich pasta. Although I would have wanted to down the entire dish myself, I'm glad we shared it -- it was incredibly delicious, but its enjoyment is certainly maximized in smaller portions. Just with the other main courses we shared, I loved this one, too! 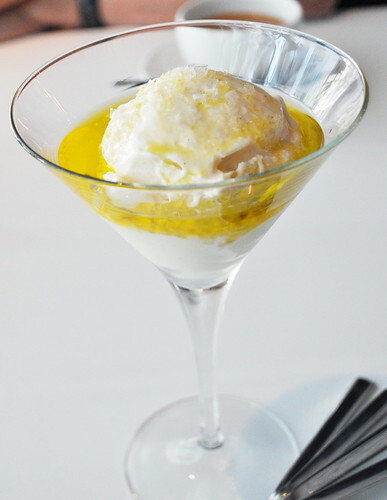 At the end of the meal, we decided to share the panna gelato with extra virgin olive oil and sea salt for dessert. It reminded me of a flavor offering at Big Gay Ice Cream Shop here in New York City -- vanilla soft-serve with the optional topping of olive oil and sea salt -- so I thought it'd be fun to try it at an actual Italian restaurant. The presentation was cute -- a scoop of panna gelato floating in a pool of extra virgin olive oil and sprinkled with crystals of sea salt, all inside a martini glass. While it was a beautiful dessert to behold, its initial taste was not as lovely -- way too salty and olive-oily. We didn't realize it would be better to mix it all together first, before digging right in. The olive oil and the salt were really concentrated towards the top with the neutralizing effects of the gelato working the opposite direction and sinking to the bottom of the glass. After thoroughly mixing everything together, it was a little more edible, but I think if the restaurant lightened up on the olive oil (or put it on the side!) as well as the sea salt (or put it on the side, as well), we probably would have enjoyed this a lot more. 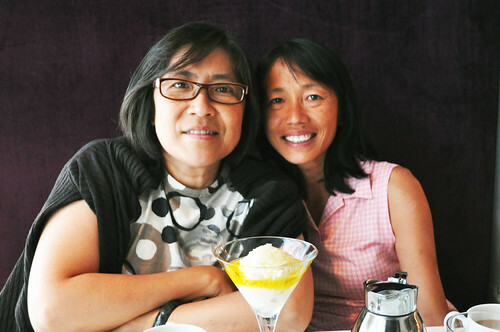 My mom and Kai Ma -- best friends since high school! 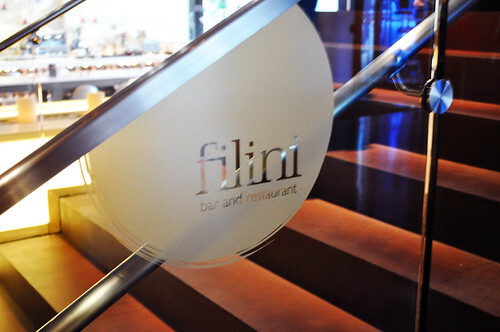 Findings: The four of us had a delicious time at Filini. The food incredibly delicious, the service was resourceful and welcoming, and the décor was astounding. For a hotel restaurant inside the Aqua Tower, this was not too shabby -- not shabby at all! All of the courses we had (with perhaps the exception of dessert) were well done and reasonably priced, resulting in a pleasant, late lunch for us, especially after enjoying the architecture of downtown Chicago, we got to eat inside one of the architectural marvels ourselves! What a lovely treat it was -- the pastas here are still haunting my food-laden dreams since we've been back. Price point: $12.50 for the antipasti, $16 for each paste, $22 for the piatti del giorno, $8 for the dolci.